Record of Friday Club Meeting on 9-7-18. We have a t-shirt fundraiser currently going on. One shirt for $20 or two shirts for $35. Orders are due Friday, October 5th. We are starting a team Google drive for sub-teams to store documentation in a consolidated place. Contact Mason for permission. If you do not want to be in photos taken by the social media team, contact Martin at (530)408-0919 or Juliette at jletalludec@student.sierracollege.edu. Hacker Lab is not able to cover our entire team’s passes this year. Please look to the bookstore for a discounted pass if needed. 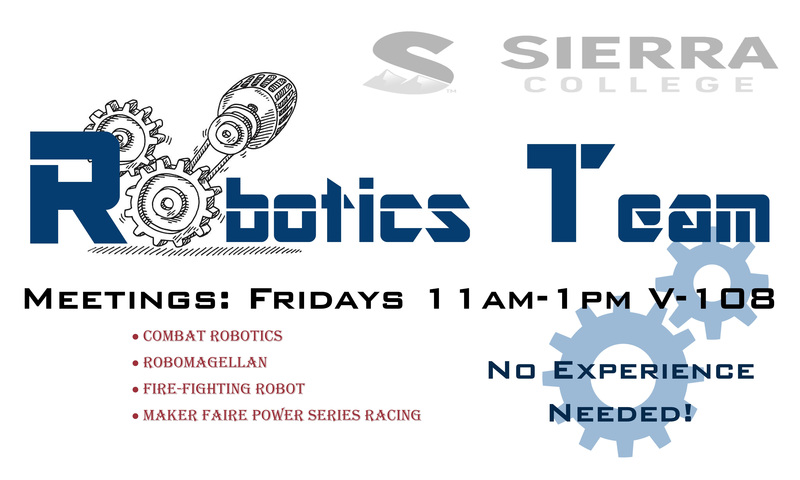 Sierra College ASSC has granted the robotics club some funding. Possibly more to come. Congratulations to the new team lead, Michael Karla. The team is in the process of CADing the bot, designing the PCB, creating the BOM and printing nozzles for their water pump. The team is setting up communications and brainstorming. They are also assembling a BOM. This group is researching methods of articulating the marionette. They are also deciding if they are going to control the marionette or have it operate autonomously. The painter bot group is reverse engineering a funnel for dispensing pancake batter onto their griddle. They have begun to 3D print prototypes for this function. The Muscle wire group is researching the effects that wire diameter has on their overall goal. They intend to move into the designing process this week. The Robo-Magellan team has been actively pursuing funding for their large BOM. They are in the planning phase and have created a mind-map of each task and topic of research. Hacker Tractor: Testing new speed controllers and troubleshooting why they burnt out in the first place. Wonder Wagon: Machining key-ways into the jack shaft. The combat bot team has decided to fix the 120 bot and the 220 bot. They are also designing a new 120 bot from scratch.